I want students to look at science and say, "That’s something I can do." These four words empower the mission of Carmen Agouridis, an extension associate professor in the Department of Biosystems and Agricultural Engineering at the University of Kentucky. Agouridis is passionate about stream restoration, mining land reclamation and STEM education, and is dedicated to helping her community understand natural processes and environmental trends. Day to day, her work takes many forms. She works in field on various projects, such as construction of an outdoor garden for Cassidy Elementary in Lexington, Kentucky. Currently she and a graduate student work in Eastern Kentucky with the Department of Forestry recreating lost forest ecosystems in areas impacted by mined land. 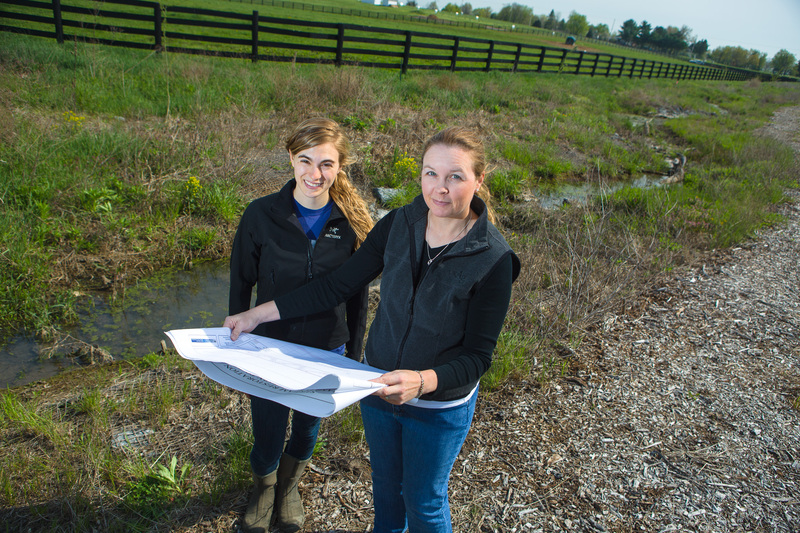 She also operates ongoing research in local stream habitats and collects data in nearby reference areas such as Raven Run. For Agouridis, however, her most meaningful projects involve educating children about STEM fields through annual workshops. As a tactile learner herself, she understands how to reach out to young children. “Personally, I need to play with it, touch it, explore it, and see what happens. I like workshops because they bring different disconnected pieces of information together as tools in your toolbox to apply and use,” she explains. This spring she is partnering with several other faculty members: Ellen Crocker from the Department of Forestry; Susan Odom from the Department of Chemistry; Lou Hirsh from the Department of Plant Pathology; Sora Kim, formerly from the Department of Earth and Environmental Sciences; and Sue Scheff, coordinator and advisor of the AMSTEMM program. They will conduct a conference called Expanding Your Horizons, which offers hands-on, inquiry-based workshops for middle school girls. Teams of graduate and undergraduate students will teach those workshops. Agouridis explains it like a mini science fair project: the girls will receive a problem, learn how various STEM majors apply to the issue and develop a solution. At the conference last year, she guided several undergraduate students in leading a water treatment workshop. After teaching the girls about pH, the students gave the girls various samples of polluted water, and items such as baking soda and a filter. The girls would investigate the pH level and determine how to raise or lower it accordingly. The girls also investigated oil and large particles such as sediment, which was represented by coffee grounds. As a mother, Agouridis sees these experiences as especially significant for females. “When I think about my daughter, I don’t ever want her to look at an activity and say, ‘That’s a boy’s thing to do.’ No. It’s a people thing to do." In the midst of busy days of researching, teaching, and managing long-term projects, Agouridis says it is those moments of student inspiration that keep Agouridis going. “I want students to look at science and say, ‘That’s something I can do,” The moment that happens—that’s golden."